You know the song The Entertainer, right? It seems to spend a lot of time in my head. Typically it shows up in those moments where things are hectic or I’m entertaining myself (hahaha...yeah I didn’t do that on purpose). I think this goes back to when I was probably about 8 or 9. What on earth may have started this you ask? Well, I took dance lessons when I was younger, and apparently we weren’t the most serious class when it came to ballet. With that being the case the dance instructor thought it would be a good idea to have our class do a routine as clowns to The Entertainer. That seemed to work for us. And I was always the flexible kid that really didn’t have much shame. At the end of the dance, I was to do a backbend and walk off the stage that way. Not a problem! I could easily do that. That is – unless I seriously injured myself first. The day our costumes arrived came and we all put them on over our leotards, complete with wigs and gloves. I wanted to try this out with the backbend/walk – I bent backwards, put my hands down, and bam! They promptly slipped out from under me and I landed full on onto my head. *Hopefully I didn't look that creepy as a clown! 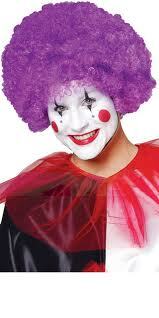 All I can say is thank goodness for that huge purple clown wig! I was a little stunned, but I am sure it could have been much worse. This is a great site where they sell original prints from various artists who choose the charity that they wish to support. Some of the charities that they support are American Forests, Computers for Youth, Puppies Behind Bars, Little Kids Rock, Teach for America, and many more. There are probably more that I would like to have too! If you have some bare walls in your house like I do – take a look at The Working Proof. There is a great selection of affordable prints that will help some great charities when you buy them. *If there isn’t something that you need you can always purchase gift certificates for someone else.